Most people have used a ladder before, either at home or at work – So, what’s the big deal? It’s just a ladder! While ladders are inexpensive and useful ways to access elevated areas, they can also be very dangerous or even fatal, if used improperly. Never use a ladder if you are feeling sick or dizzy. Visually inspect portable ladders at the time of purchase, before each use and following any incident (i.e. dropped ladders, employee accidents involving a ladder, etc.). Document inspections annually and following any incident. Select the correct type of ladder for the job. Consider the duty rating, ladder type and height required to safely complete your job task. Place stepladders, stepstools and mobile ladder stands on level surfaces. Ensure all safety feet are fully supported. Block open entries, lock or otherwise guard doorways that open towards a ladder. Always face the ladder when ascending or descending, except as permitted by certain mobile ladder stands. To maintain balance, do not climb higher than the second step from the top cap on a stepladder. However, the platform is the highest standing level on stepstools, platform stepladders and mobile ladder stands. Do not use the rear horizontal or bracing attached to the rear rails of stepladders or platform ladders for climbing or standing. These are designed solely for increasing stability. Keep the center of your body within the side rails of the ladder and maintain three points of contact at all times while ascending or descending a ladder. Ensure the spreader assembly of a stepladder is fully opened and locked before use. Never climb a folded stepladder. Never use a portable ladder in excess of its intended working load (i.e. duty rating). Never attempt to move, shift or extend a ladder while standing or climbing on it. Set-up ladders close to the work area and do not over-reach. Never place a ladder on boxes, barrels, or other unstable bases to obtain additional height. Remove damaged ladders from service and tag as “Dangerous, Do Not Use,” or with other similar language, until the repairs are made. Note: Ladders that cannot be repaired must be withdrawn from service and destroyed in such a manner as to render it useless. Never use a metal ladder when working on electrical equipment or components. If possible, get the assistance of a co-worker to hold the ladder while you are using it. Inspect the ladder before you use it. To meet OSHA’s requirement to ensure ladders are inspected to identify any defects that could cause injury, departments that own portable ladders are required to document portable ladders annually – including but not limited to all styles of stepladders, mobile ladder stands and stepstools. For laboratories, a record of the annual inspection may be maintained electronically, on a ladder inspection tag affixed to the ladder, or on a printed form that is kept in the laboratory binder. The duty rating, safety and instructional labeling is present and readable. All hardware connections are secure and in good condition (i.e. no corrosion, etc.). Surfaces are free of sharp edges, splinters and burrs. Side rails and bracing are free of dents or bends. Steps, handrails and guardrails are not excessively dented. The spreader assembly of stepladders and platform ladders is intact, not bent and locks correctly. 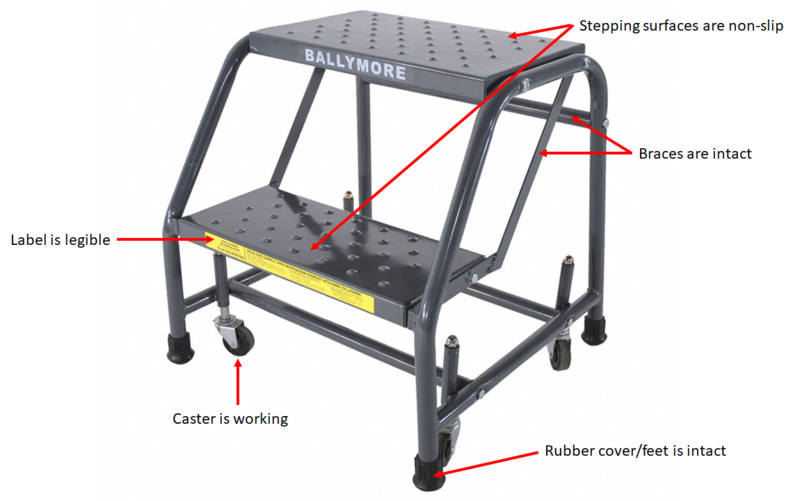 The safety feet and other components (such as casters, guardrails, etc.) of mobile ladder stands are present and in good condition. Steps and platforms are free of oil, grease or other slippery substances. The side rails, rungs or cleats of wooden ladders are free from shake, wane, compression failures, decay, or other irregularities. No modifications have been made to the ladder without written approval from the manufacturer. This entry was posted in EHSO and tagged ehso, lab rat newsletter, lab safety, research safety. Bookmark the permalink. Both comments and trackbacks are currently closed.